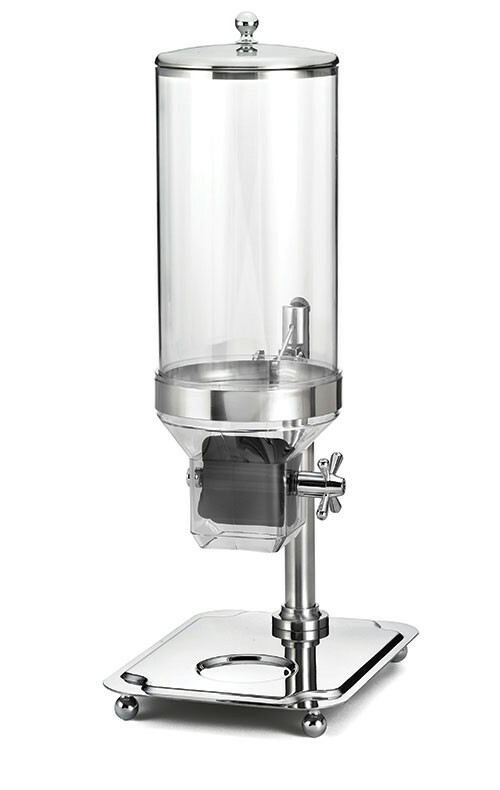 LionsDeal > Shop By Business > Bakery Shop > Bakery Displays >< Bulk Food and Cereal Dispensers > TableCraft 69 Stainless Steel and Polycarbonate Cereal Dispenser, 50 oz. TableCraft 69 Stainless Steel and Polycarbonate Cereal Dispenser, 50 oz. The Cereal Dispenser, 50 Oz lets you display and serve breakfast cereal and other loose food items in an attractive way while minimizing waste and mess. Designed for use on table tops, counters and buffet tables, these cereal dispensers have a polished stainless steel base and a clear polycarbonate container. A quick turn of the easy-grip knob dispenses a single 50-oz portion. 13-1 / 2" x 10" x 27"